When jewelry is the focal point of your store, then you want to ensure that you're accentuating your inventory with the best display units possible. 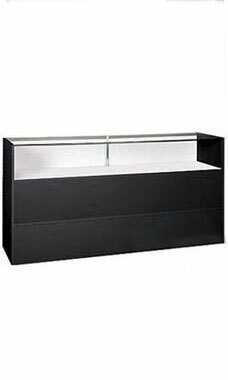 The Fully Assembled Jewelry Display Case with Black finish from Store Supply Warehouse is a modern classic that will match almost any fixture within your store. It's a modern classic, and it will provide you with dependability for years to come. This particular case offers a low pressure melamine laminate finish with tempered glass top, front and sides to provide a reliability and optimal vision for customers looking to make a purchase. Additionally, the jewelry display case features white sliding rear doors and a concealed rear storage area. This provides jewelry retailers an easy way to stock supplies, and access inventory. Crating for secure shipping is included in the price of the case. Optional lock and light kit are available but sold separately. Glass display area measures 12"H, while overall size measures 38"H x 18"D x 70"L. Fully assembled and ready to ship.